Why is it that even though I know things are not as horrid as it seems I still put them off?? For example laundry. Now if I had to do it as my foremothers did, well yes I could then see the dread. I mean washing by hand on a scrub board over a boiling pot of water, dragging the basket of wet things to the line and trying to keep the kids and dogs from dumping the clean clothes In the mud I would dread. I however do not have to do the laundry the way they did. I have a wonderful large capacity washer and matching dryer. Though I would like a clothes line because I prefer sun and wind dried sheets and towels. Laundry for me takes about 15 minutes of actual labor time. The machines true take up to 2 hours to do their part but for me, the loading, switching, unloading and folding putting away is maybe 15 minutes of work. Yet I put it off. Why? Perhaps this would make it more fun? Cleaning my bathroom is another dreaded task when in actuality; it is a small bathroom with not a lot of clutter. It takes maybe 30 minutes, including mopping the floor. Yet again I groan under the weight of the task. Now all these tasks do get done. Not as often as I would like but I do not live in a dirty heap either. Though dust seems to be my arch enemy… in part because some areas are so hard to get to. Like the mantle behind the Tv. I can not reach that are so it is blank and dusty. What things do you avoid even though you logically know it will take only a few minutes to get them done? Yesterday Beloved and I went to get some things we needed. Wood to build him the bookcase he wanted in the living room. The big item though was a ceiling fan. A simple purchase we thought. We just wanted a simple white fan with lights for the kitchen. We were dismayed to find that big brother has stepped into our home once again. Now he demands the right to tell us what kind of lights we can use. My theory is since folks did not fall easily into line on the bandwagon that incandescent bulbs (or regular bulbs) should be junked in favor of the (much) costlier and (supposedly) more effective florescent bulbs the ptb decided to force the issue. So they created a bunch of rules so manufacturers can no longer make light fixtures that take the regular bulbs. I don’t care how many times “they” tell me the new bulbs are better than the old, from personal experience I disagree. I can not see as well with the $14 bulbs as I can with the $1.97 ones. The $14 ones do not last me 5 years or more, they burn out about every 8 to 12 months, just like the $1.97 ones do. Plus the big seller, the power bill, well mine shows no difference. We did go all $14 bulbs a couple years ago. It did not affect our light bill by more than $5. That could have been due to not using the dryer a couple days or something too. The new bulbs are flat a waste of money. For my life anyway. Some folks can see in those dimmer lights, I can not and I won’t buy any light fixture after this that has them. I will either fix my old ones or buy second hand. As it is this new fangled light thing doesn’t fit my something or other right anyway and so we will have to wait and now redo the ceiling lighting in the kitchen just to put up a new light. Unless I find an older one someplace! To cool off our irritation we drove to DQ for an ice cream. We decided to sit In the Wal-Mart parking lot (I have my eye on a set of dishes there that I can not decide if I want bad enough to spend the money on or not.) and eat it. I wanted the new bed in a bag comforter set they have anyway. So while we were relaxing and enjoying our ice cream we saw an older gentleman wandering the parking lot. He was most definitely lost looking for his car. After watching him for a few minute MJ decided we would try to help him. We pulled up along side and asked if he was lost. The gentleman grinned and said “well I have walked nearly 5 miles”. MJ asked if we could help him and what kind of car he had. Then offered the gentleman a lift to find his car. He got in and we began looking. We found it just a couple minutes later. The gentleman knew the license of his car and just had forgotten where he parked! He was only 3 spaces away from the door he had come out of and had spent a long time wandering around before we saw him. Thank God we got so irritated at Lowes we needed a break! I was lucky enough to catch this book on a “free” day. 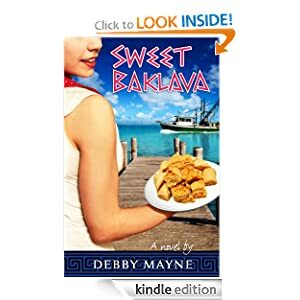 Sweet Baklava is the story of Paula Andrews and Nick Papadopolous. I gotta say, I identify some with Paula. However I think she is sometimes too enabling. Paula and Nick were high school sweet hearts. She came to Tarpon Springs with her mother. Nick was born and raised there among his large Greek family. Paula craves a stable life, secure, well planned and smooth. Nick wants some adventure. When Paula graduates and goes off to college Nick is led to believe by her mother that she will not come back. So, feeling hurt and alone he joins the Air Force. Never saying anything to Paula. 10 years pass and neither is over the other but refuse to admit it. Nick comes home on leave determined to win Paula once and for all. This story is a Christian romance. I am usually not one for modern stories. I prefer Grace Livingston Hill to most modern writers.I do admit at times I thought the story was dragging on. However on the whole it was a sweet story of patience and trusting God to work out the details. Will I read it again? No. Therefore I would recommend this as a library selection and not a purchase. Thoughts on a Sunday Morning. I have been having some intense thoughts for several months and I think it is time I put them into words. I float around the web. Besides the site I own I visit several other sites. Only one regularly. On that site I feel a definite negative vibe to the Christian view point. I have been thinking about this and I finally came to a place where I think the divide begins. Christ said the world would hate us just as it hated him. What most folks try to do is guilt Christians into being what the world thinks a Christian should be. When Christians stand firm on anti-God things the world tells us we do not have a “Christian” attitude. Some even claim to have been believers at one point but left because of hypocrisy in the church. The problem is these folks are fallen away. Lured away by the supposed righteous indignation of the world. Get a grip the world is not righteous. Only God who created it, his Son and the Holy Spirit are righteous. Let’s look at what God calls Christians to do. We are to be meek. No flaunting ourselves. Mat. 5:5. There is a list of things we will be. God calls it the fruit of the Spirit. Gal 5:23 gentleness, self-control; against such things there is no law. Gal 5:24 And those who belong to Christ Jesus have crucified the flesh with its passions and desires. Gal 5:25 If we live by the Spirit, let us also keep in step with the Spirit. Gal 5:26 Let us not become conceited, provoking one another, envying one another. We are also told what we will NOT do if we are true to Christianity. Gal 5:17 For the desires of the flesh are against the Spirit, and the desires of the Spirit are against the flesh, for these are opposed to each other, to keep you from doing the things you want to do. Gal 5:18 But if you are led by the Spirit, you are not under the law. Gal 5:21 envy, drunkenness, orgies, and things like these. I warn you, as I warned you before, that those who do such things will not inherit the kingdom of God. 1Co 6:10 nor thieves, nor the greedy, nor drunkards, nor revilers, nor swindlers will inherit the kingdom of God. 1Co 6:11 And such were some of you. But you were washed, you were sanctified, you were justified in the name of the Lord Jesus Christ and by the Spirit of our God. Notice in the Corinthian verses, And such WERE, past tense, some of you. In other words you can not claim being saved while still practicing worldly living. You can not support the ideas of worldly living as a saved believer. Now does that mean we hate and wish harm on those who are worldly? No, enmity is hate. Which is listed up there as not a fruit of the spirit. So the world has enmity with us because we do not buy into their fleshly, feels good, I want to do it so I can ways. Yet they want us to believe that by being against these things we are not real Christians. The world knows that God does not speak against things we can not control. How do I know they understand that? Because suddenly many things Christians stand against are diseases, disabilities or otherwise listed as things that are unavoidable. Alcoholism is now a disease. No it is not. It is a choice. From the first drink a person makes a choice to take the next. Eventually the alcohol can gain control. Addiction always begins with a choice. Christians can drink. We can not become drunk. There is a distinction. Homosexuality is the same. God did not put it in our dna, there is no scientific proof that there is a gene for homosexuality. It is a choice. Once the choice is made walking away from it may not be easy but God condemns it so you can not choose it and him at the same time. Are homosexuals bad people? Not all of them. Some are kind and loving and so on. They are still in sin and condemned when they choose that sin over God. One of the big ones for me is helping others. I love to help others. However even in this there are biblical guidelines. Those who will not work should not eat. 2Thes 3. The widows who get help are widows indeed. That is a woman whose husband has died, not a divorcee or single mom, and she is about 65 years old. Nor should she have family that can help her. If she does it is her family’s job to help, not the church’s. 1 Tim 5. These things sometimes are hard for us. The church’s first mission however is to teach the word of God. God knew that we would be easy marks for all if we were not told how to judge and decide who and when to stand firm. Regardless of what the world says, we need to remember who is in charge of our lives. Here is a hint, it is not the media. I am not a shopping girl. I am wearing out my last pair of earth spirit sandals. I mean to the point they now hurt my feet. I keep looking for a new pair of shoes but nothing looks good. I want THESE shoes over again. If I find more I plan to buy a few pair so when I wear out the next ones I don’t have this problem! I also like those… I think they call them baby doll shoes. They look kind of like Ballet shoes but with solid rubber soles. I do not like shoes. Even in winter I wear sandals. Here it is not a huge thing since we rarely get snow. I do have a pair of asics aerobic shoes that I dread wearing out. I use those if I will be away from home on my feet for a while. At home I mostly wear these sandals (sorry flylady) I do wear my sneakers for my walking work outs and if I am working in the yard. Mainly because we have “Spanish sticker” weed mixed into the grass around the house. I think I got rid of most of it but now and then I get an unpleasant surprise with a thorn in my toe! I am working on a list now of things I do need to get for the house and myself. A RED coffee maker. I think I found one on Amazon I like. Some page magnifiers so I can really read this gorgeous Bible Beloved got me for my B-day last year. I may splurge on a new purse at some point.